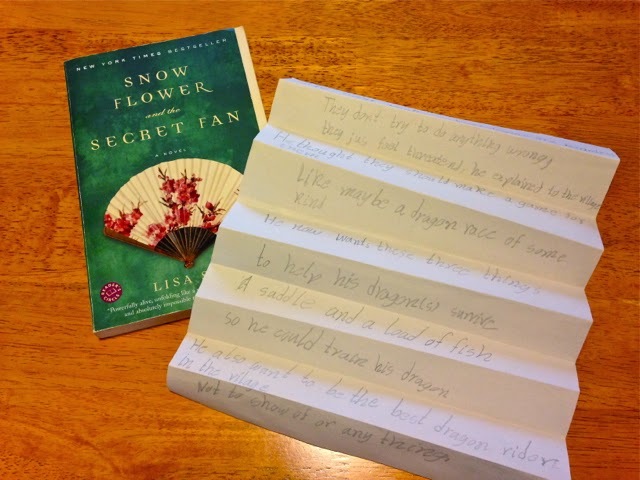 When I read Lisa See’s Snow Flower and the Secret Fan, I was captivated by the idea of two women sharing a history by exchanging notes in the folds of a fan. 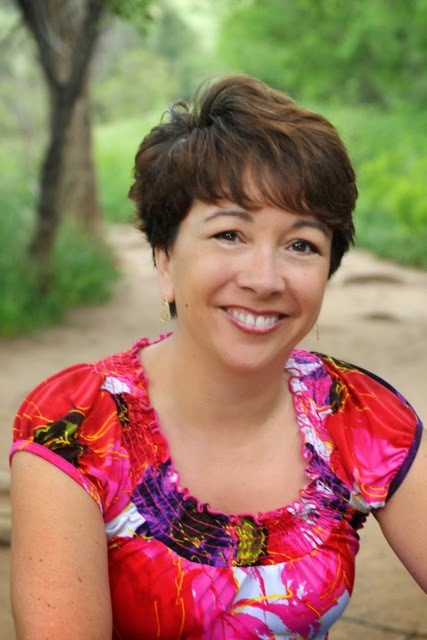 I teach young writers for Denver’s Lighthouse Writers Workshop, and I decided to create an exercise using fans. The opening of a fan is a vivid metaphor for storytelling. Sometimes we get so caught up in pushing a scene from point A to point B that we glide over opportunities for a more intimate look at the character’s experience. We may offer sensory descriptions, but overlook imbuing those descriptions with the way a character's emotional state and personal history affects the way the view looks, the way tones sound, the memories that smells evoke. We may write dialogue, but neglect to reveal the physical tells or intruding thoughts that communicate more than spoken words alone. Or, we may dart from action to action, instead of pausing to drive home the impact of each action. When I see the scene as a fan, I envision unfolding its inner life, exposing things I didn’t know were there, revealing what’s under the surface. Closed, it simply looks like red-and-gold paper, but open it up and...ooh, look at the white crane hidden inside! The fan reveals layers, and so does the scene, opening opportunities for surprise. Here’s my favorite part of the fan metaphor: fans are fun! I've seen writers young and old respond to this idea. I recently taught an elementary school workshop in which we used construction paper folded into fans. (In truth, they looked more like window shades.) Each sheet yielded about five creases, or ten folds—twenty if you count the back. I asked the children to write five lines from their stories-in-progress into every other fold, leaving the folds in between blank. Then I asked them to write a new sentence into each blank fold, one that offered more detail about what happened in the previous sentence. The goal was to read all ten sentences in order and have them make sense as a scene. Some kids grasped the idea, opening up the story with new sentences. Others simply rewrote the sentences they had already written. Either interpretation was fine, because they all expanded their scenes with more details. The folds do more than you might think, because you cannot get away with simply making the scene longer. Instead, the new information must illuminate what’s already there. Otherwise it won’t flow with the rest of the story. There are many possible variations on the fan exercise, such as: 1) write dialogue on every other line, and then add physical tells or internal monologue in between, 2) tell a group story in which each person contributes one line, or 3) create a fictional correspondence between two people à la Lisa See. I’m preparing for a summer writing camp at Lighthouse, and my fellow instructor and I want to order either white folding fans or a fan-making kit. I love writing on objects that have another purpose, such as paper cups, cereal boxes, or even airline barf bags. (Those are fun for letters because you can tuck in the tabs to create a self-contained envelope.) I believe when we take writing into a three-dimensional space we open ourselves and our stories to reveal more than we first imagined. What a clever way to layer in more depth and details. Thanks, Terry. I did have to laugh when I realized that I could do the same thing with lined paper. ;) But I guess actually seeing the folds makes something click for some people. I'm eager to try this! It's a total sensory experience with an ah-ha at the end. Thank you! Glad to hear it, Helen. Thanks. I love it when an idea works and I can pass it on. One of the things we catch often in our critique group is a lack of response or reaction. This big thing happens and it is never discussed, etc. There have been long discussions especially about how people react to the inciting incident. It is important to take a look at how the entire story world is impacted by the event, too, not just the main characters. I'm not saying switch view points etc. I mean that an alien ship crashing would be big news! The citizens of planet Zircon would not be going calmly about their day. A murder rattles the community it happens in. A love story affects friends and family. Ah yes, Diana. I've been through that one too. "Oops, where did all the other people who live here go?" Maybe it would also be helpful to imagine a story in the form of a pop-up book and take a walk around each scene to see what we might be missing. The fan brings new dimension to layering -- a way to do it that never occurred to me but which makes great sense. As Diana points out, our world does not include just us and whoever else happens to be in the room; what we do or experience has a ripple effect that flows out the door to others with whom we have a relationship or connection. Thanks for sharing, Cara. I'll be incubating this idea for a bit. I'm a big fan of the Tigers ... and they are playing the Twinkies this afternoon ... wonder how that story will play out? ;) I suspect the Twinkies will get eaten alive by the competition. This is a wonderful idea! I've done a fun story exercise where each person writes a sentence, then the next person writes the next, passing it along and covering up all but the last sentence. Some very entertaining stories came from that! That sounds fun, too, Heidi. I'll have to pop that one in my teaching toolbox. It reminds me of an exercise I did at a workshop in which each of us only had about 30 seconds to draw someone's head. Then we folded the paper leaving just the neck exposed, and someone attached a body. Then we folded again, and someone attached the feet. Then we opened them up and hilarious monsters appeared!